LIFETIME POWER TRAIN WARRANTY ON THIS IMMACULATE 2012 RAM 1500 CREW CAB LONGHORN 4X4!! Take a very close look at this extremely CLEAN 2012 Ram 1500 Crew Cab Longhorn 4WD that just arrived here at Boyles Auto. Sitting on Brand New 20 Inch M/T Tires, Leveling Kit, and ready for the road. Nicely equipped with all power, Turn Knob Four-Wheel Drive, Heated and Cooled Seats W/ Lumbar, Large Touch-Screen Radio, Alpine Speakers, Power Pedal Adjuster, Steering Wheel Mounted Controls, Keyless remote, Rear Vents, Rear Seats Fold Up and a Storage area is underneath, power windows, power sliding rear window, Painted to Match Running Boards, and much much more. This truck drives and handles perfect, and the Hemi 5.7L has all the power you'll ever need. 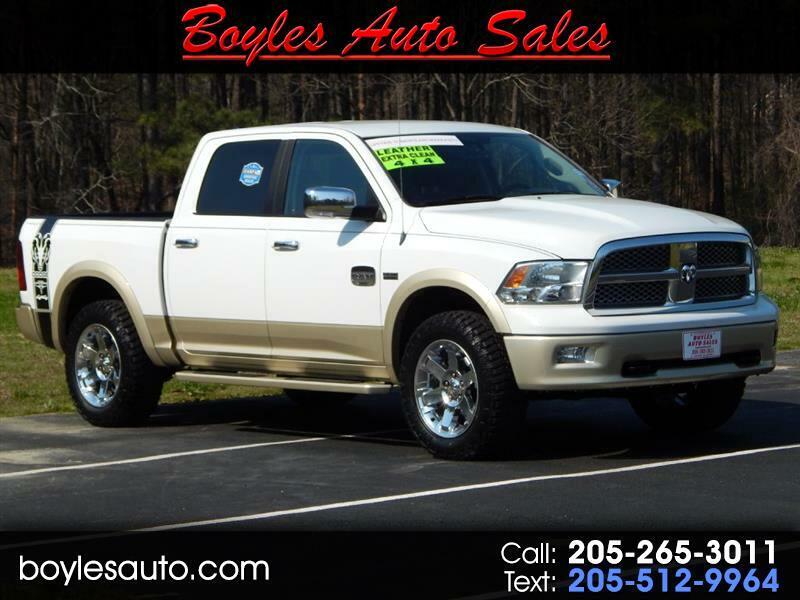 Make the short drive to Boyles Auto Sales and take it for a test drive today. We offer bank and credit union financing with LOW LOW RATES, so you can drive this Ram 1500 Crew Cab Longhorn 4x4 home today. Also, for that added peace of mind remember this: THIS EXTREMELY CLEAN 2012 RAM 1500 CREW CAB LONGHORN 4X4 COMES WITH A LIFETIME ENGINE, TRANSMISSION, & DRIVETRAIN WARRANTY AT ZERO COST TO YOU!! NOT A 30, 60, OR 90 DAY WARRANTY.... A LIFETIME!! Call Randy at 205 269 3196, or Tucker at 205 265 3011. Visit us online at boylesauto.com to see more like this one, or to fill out a credit application for faster financing options. Thank You for Looking.